Lucida, thuribulum redolens, campana sonora." 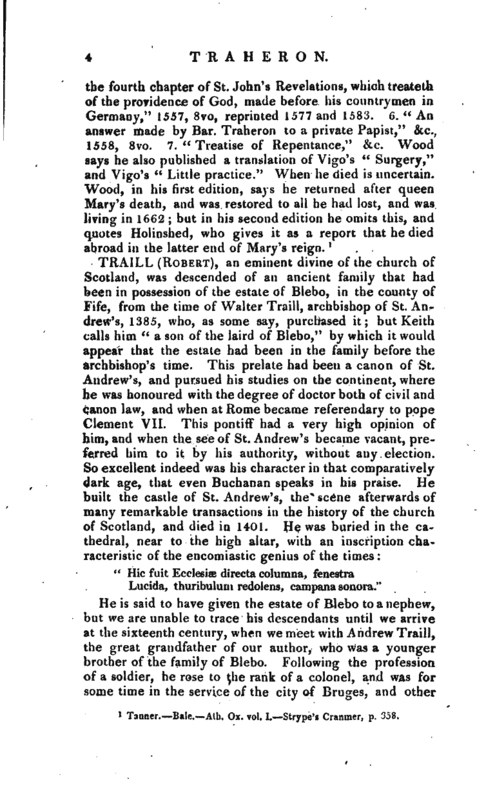 He is said to have given the estate of Blebo to a nephew, but we are unable to trace his descendants until we arrive at the sixteenth century, when we meet with Andrew Traill, the great grandfather of our author, who was a younger brother of the family of Blebo. Following the profession of a soldier, he rose to the rank of a colonel, and was for some time in the service of the city of Bruges, and other | towns in Flanders, in the wars which they carried on in defence of their liberties, against Philip II. of Spain. When he left this service his arrears amounted to 2,700l. for which he received a bond secured upon the property of the States. He then served under the king of Navarre, afterwards Henry IV. of France, in the civil wars of that kingdom, and had occasion to do that prince considerable service in taking a town by stratagem. Upon his return to Britain he was made a gentleman of prince Henry’s privychamber. 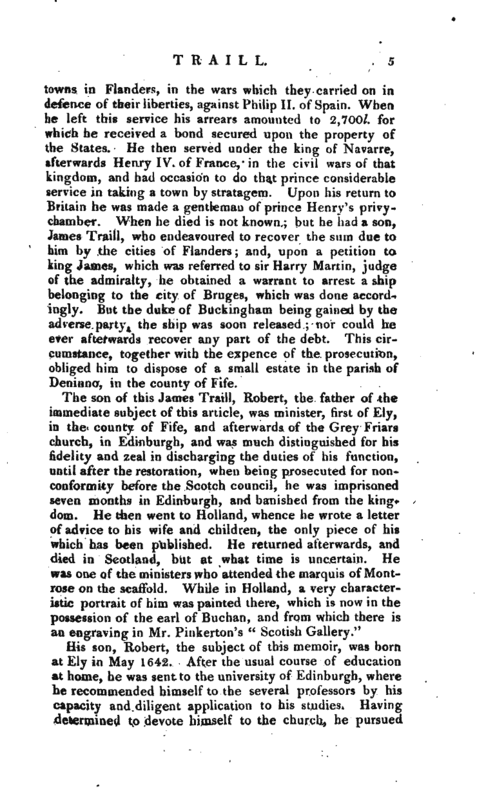 When he died is not known; but he had a son, James Traill, who endeavoured to recover the sum due to him by the cities of Flanders; and, upon a petition to king James, which was referred to sir Harry Martin, judge of the admiralty, he obtained a warrant to arrest a ship belonging to the city of Bruges, which was done accordingly. But the duke of Buckingham being gained by the adverse party, the ship was soon released; nor could he ever afterwards recover any part of the debt. This circumstance, together with the expence of the prosecution, obliged him to dispose of a small estate in the parish of Deninno, in the county of Fife. His son, Robert, the subject of this memoir, was born at Ely in May 1642. After the usual course of education at home, he was sent to the university of Edinburgh, where he recommended himself to the several professors by his capacity and diligent application to his studies. Having determined to devote himself to the church, he pursued | the study of divinity with great ardour for several years. Partaking with his father in zeal for the principles and discipline of the presbyterian church, he became a sufferer in its cause, unusual severity being exercised against those who would not accede to the introduction of episcopacy. In 1666 he was obliged to secrete himself, together with his mother and elder brother, because some copies of a book entitled “An apologetic Relation,” &c. which the privy council had ordered to be publicly burnt, were found in Mrs. Traill’s house; and in the following year, being suspected as having been one of those who took up arms and resisted the king’s forces, or of being a favourer of their cause, a proclamation was issued for apprehending him. 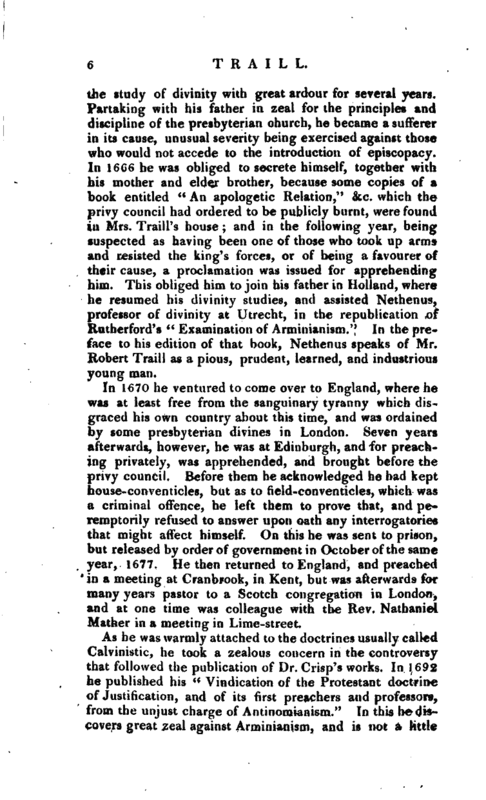 This obliged him to join his father in Holland, where he resumed his divinity studies, and assisted Nethenus, professor of divinity at Utrecht, in the republication of Rutherford’s “Examination of Arminianism.” In the preface to his edition of that book, Nethenus speaks of Mr. Robert Traill as a pious, prudent, learned, and industrious young man. In 1670 he ventured to come over to England, where he was at least free from the sanguinary tyranny which disgraced his own country about this time, and was ordained by some presbyterian divines in London. Seven years afterwards, however, he was at Edinburgh, and for preaching privately, was apprehended, and brought before the privy council. Before them he acknowledged he had kept house-conventicles, but as to field-conventicles, which was a criminal offence, he left them to prove that, and peremptorily refused to answer upon oath any interrogatories that might affect himself. On this he was sent to prison, but released by order of government in October of the same year, 1677. He then returned to England, and preached in a meeting at Cranbrook, in Kent, but was afterwards for many years pastor to a Scotch congregation in London, and at one time was colleague with the Rev. Nathaniel Mather in a meeting in Lime-street. As he was warmly attached to the doctrines usually called Calvinistic, he took a zealous concern in the controversy that followed the publication of Dr. Crisp’s works. In 1692 he published his “Vindication of the Protestant doctrine of Justification, and of its first preachers and professors, from the unjust charge of Antinomianisrn.” In this he discovers great zeal against Arminianism, and is not a little | displeased with those divines who were for adopting what they called a middle way, and who wrote against Dr. Crisp. Life prefixed to his Works. Wilson’s Hist, cf Dissenting Churches. 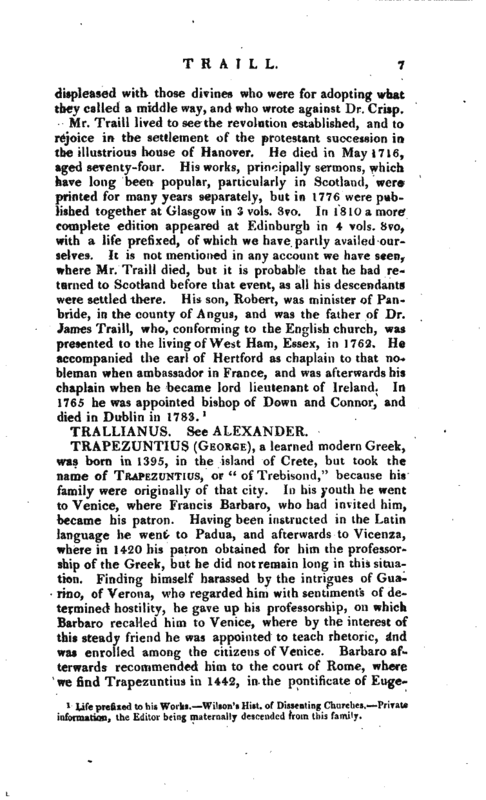 Private information, the Editor being maternally descended from this family.